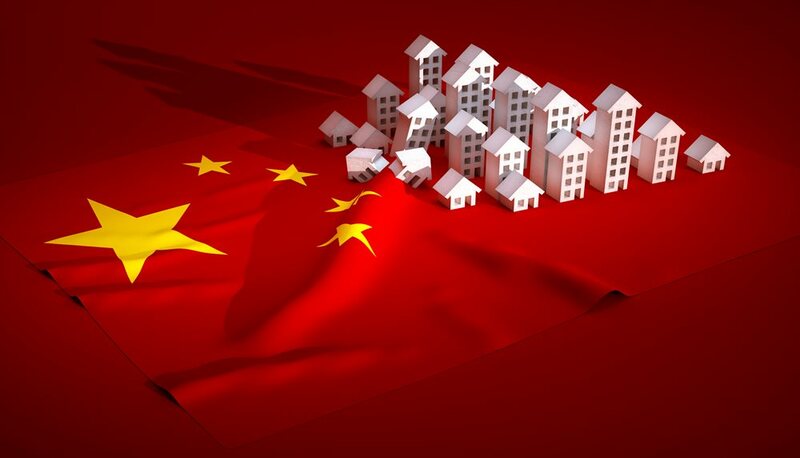 Is China's Slowing Property Sector a Cause for Concern? To continue reading the rest of this whitepaper, simply fill out this form and you will get immediate access to all the data, charts and analysis written by our analysts on this topic. By providing your details you are consenting to us contacting you. Click here for more information. The boiling hot real estate market is cooling down after insane growth in 2016. 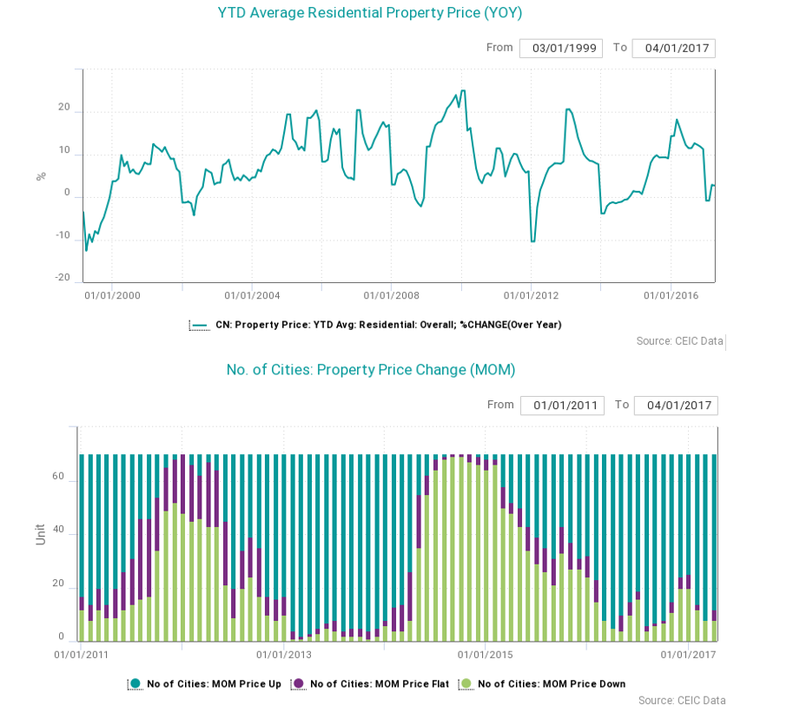 In a recent NBS note, residential property prices slowed to 15.3% and 20.3% y-o-y, respectively, in Tier 1 and some hot Tier 2 cities Although growth is still in the double digits, the marginal deceleration clearly indicates that recent restrictive policies are taking effect and that property prices in Tier 1 cities are leading indicators of those in Tier 2 cities, which in turn lead those in Tier 3 cities. According to NBS, hot T2 cities are Tianjin, Nanjing, Wuxi, Hangzhou, Hefei, Fuzhou, Xiamen, Jinan, Zhengzhou, Wuhan, and Chengdu. 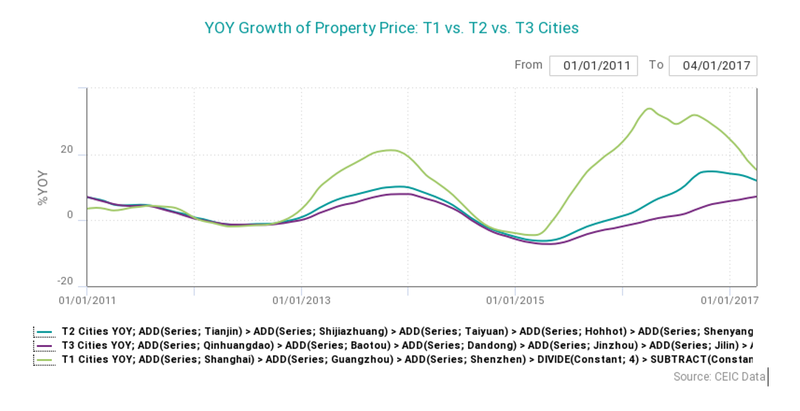 In T1 cities, the recent high occurred in April 2016, with 33.85% y-o-y growth in property price. In hot T2 cities, the highest growth (30.95% y-o-y) occurred in October 2016, exactly six months after the T1 high, indicating a six-month lag. 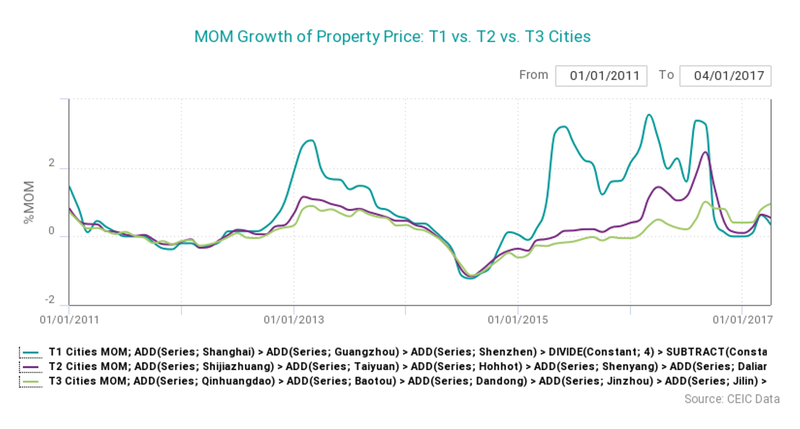 If we extend to T3 cities, however, the ”music” keeps on going — property price growth was still accelerating in April. 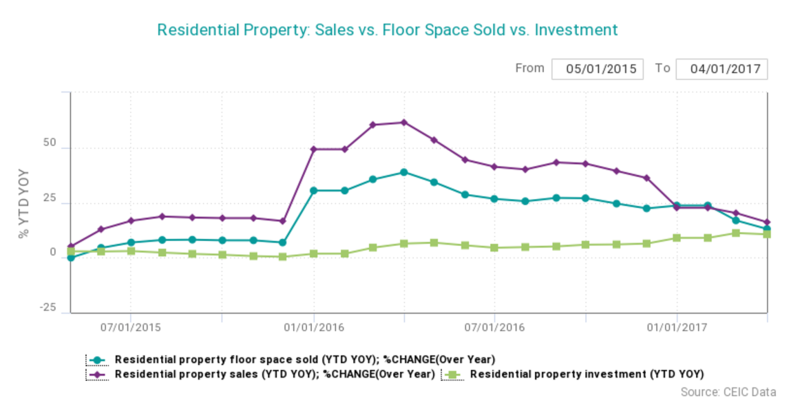 Similar cooling signs can be seen in residential property sales (16.1% vs. 20.2% previously), volume (13% vs. 16.9%), and investment (10.6% vs. 11.2%). In any real estate cycle, restrictive policies are not uncommon. But this time, tightened policies are at all-time high. 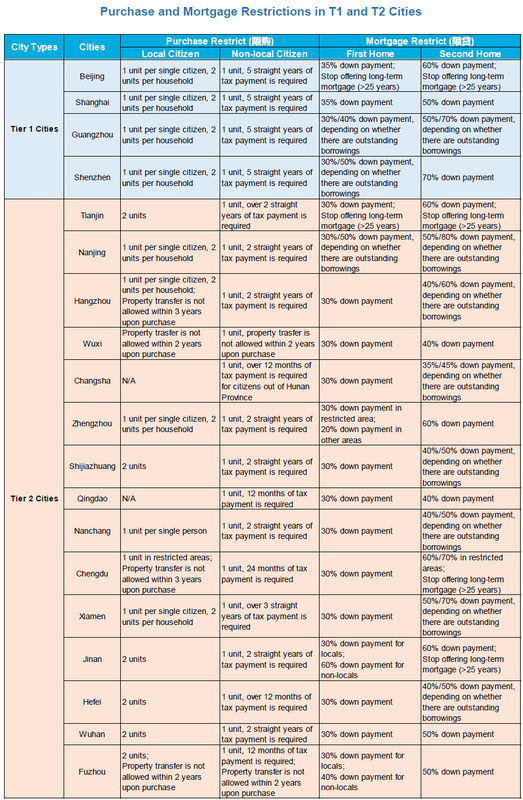 The following table lists a few T1 and T2 cities along with their restrictive guidelines. Evidently, local governments were trying every possible means to curb housing speculation: continuous tax payment records are required, purchase restrictions apply to single citizens, and resale within two years is forbidden. The list grows even longer when as more cities launch their “creative” restrictions. In this sense, local governments are proactively responding to the central government, which reiterated” houses are for living, not for speculating” (“房子是用来住的，不是用来炒的”). 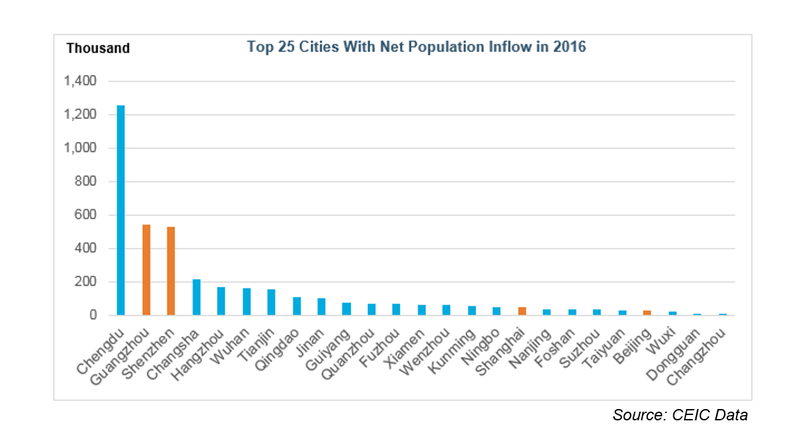 According to net population inflow last year, Chengdu (+1259.6K), Guangzhou (+542.4K), and Shenzhen (+529.5K) were the top three recipients of outside population, while traditional hot spots like Shanghai (+44.3K) and Beijing (+24K) ranked in the bottom of the top 25 cities because of tight population controls. Typically, the larger the population inflow, the more home supply needed. Nevertheless, some cities did not follow this common rule. 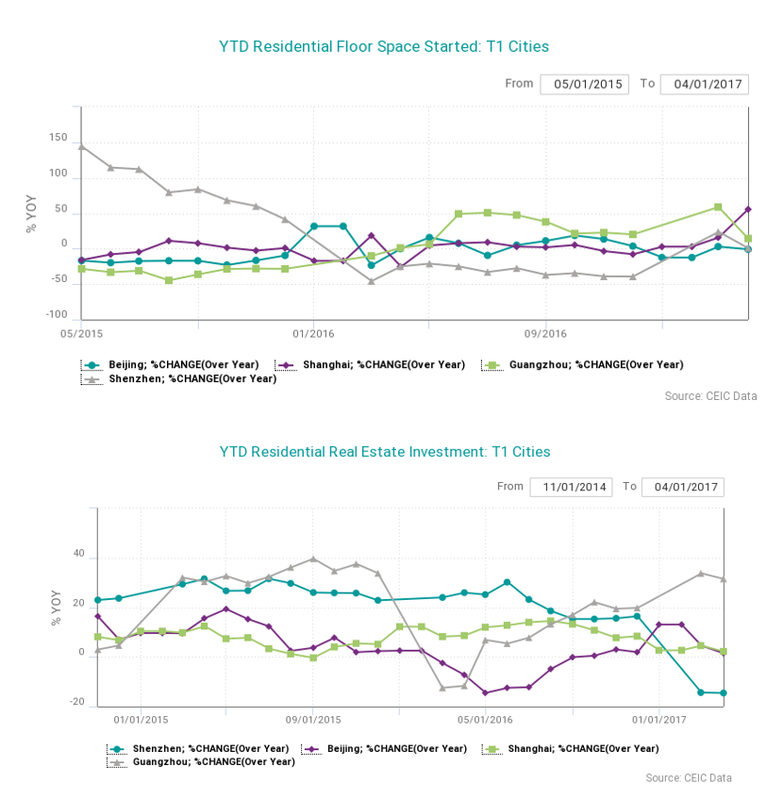 In terms of new floor space started, Shanghai is the only T1 city with faster growing space supply (+55.5% YTD y-o-y). 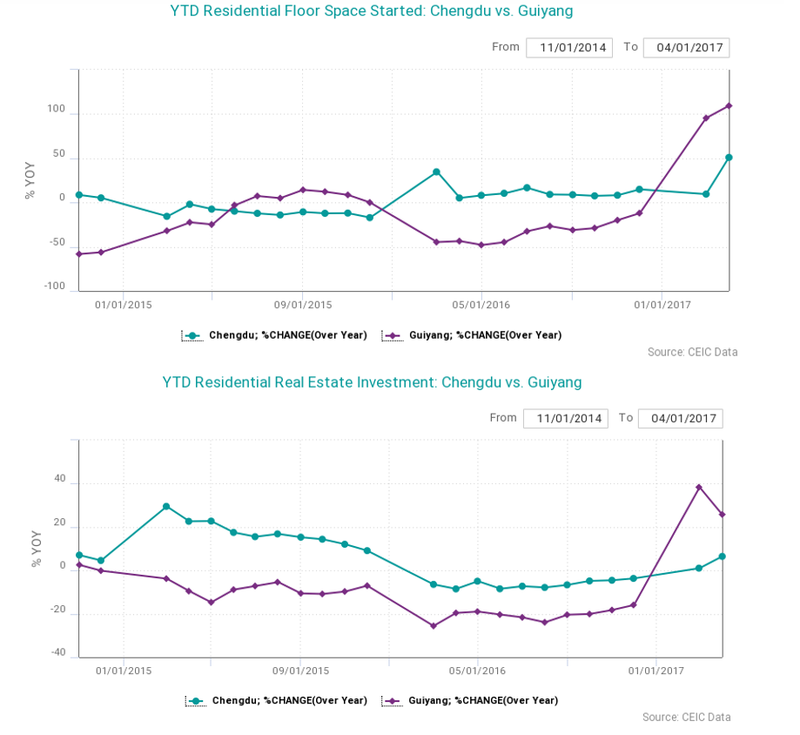 Among the top 10 recipients of outside population, only Chengdu (+51% YTD y-o-y) and Guiyang (+109.3% YTD y-o-y) expanded home supply. 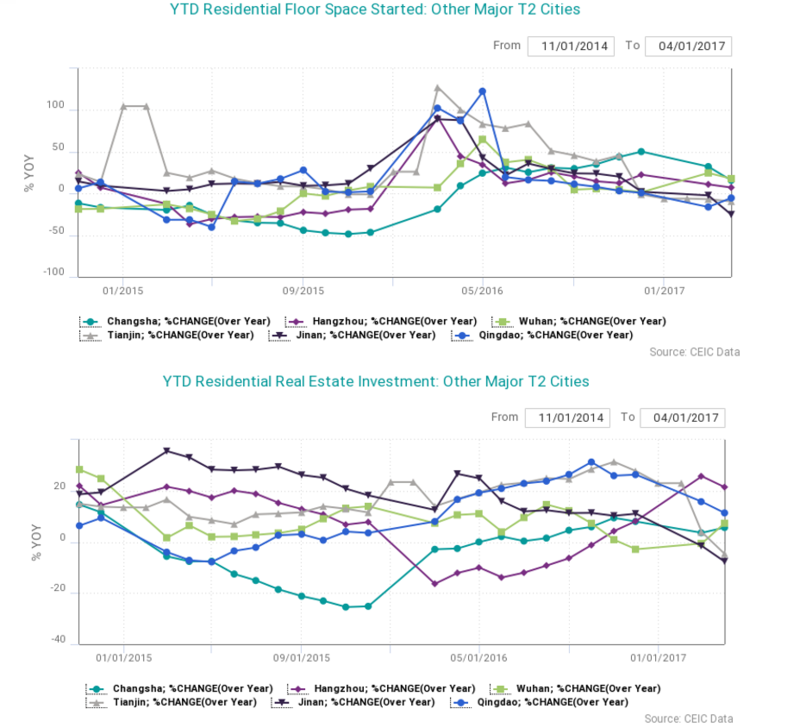 In contrast, Beijing (–0.96% YTD y-o-y), Qingdao (–5.3%), Tianjin (–9.4%), and Jinan (–25.3%) reduced their residential home supply. 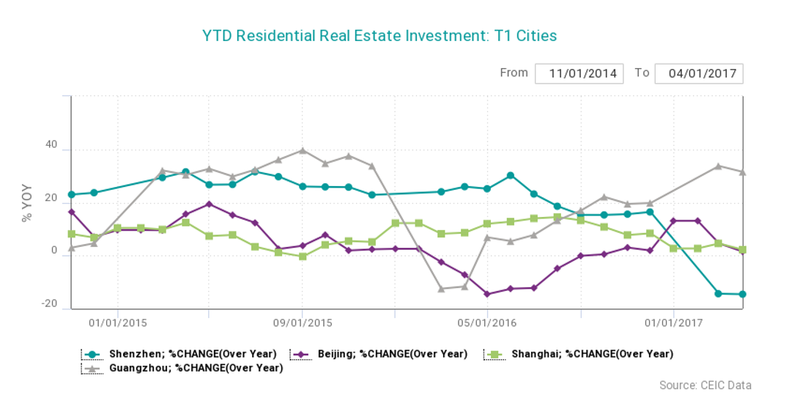 Additionally, Tianjin (–4.6%), Jinan (–7.7%), and Shenzhen (–14.5%) saw contraction with regard to residential real estate investment. According to central government guidelines, these cities should have expanded home supply given continuous population inflow, but they are responding slowly. 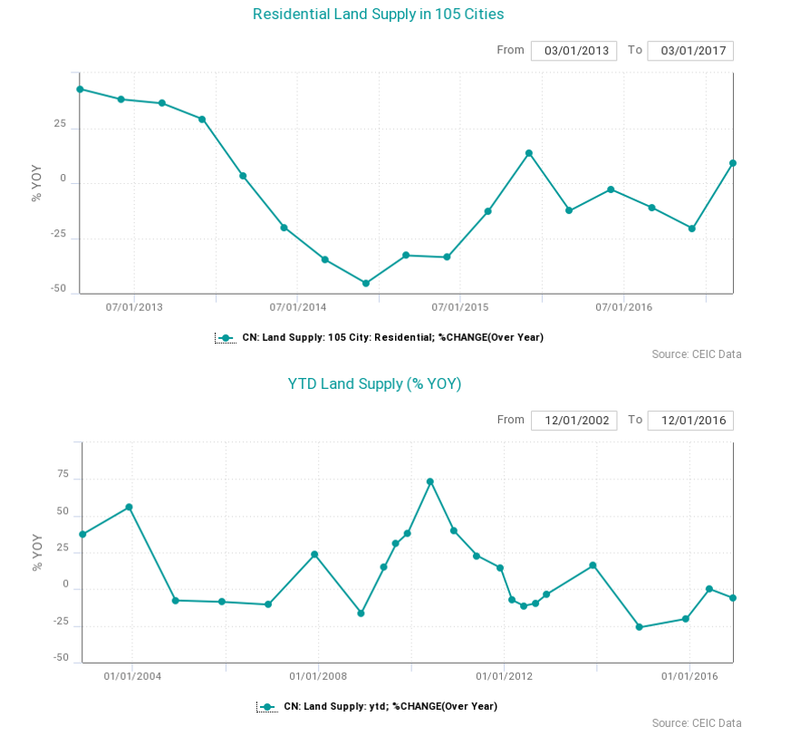 These cities are clearly going against the guidelines of supply expansion, and observers believe that if this declining trend is not reversed in the foreseeable future, the recent restrictive policies will temporarily shift current demand to the future, making future property prices in these cities even higher. 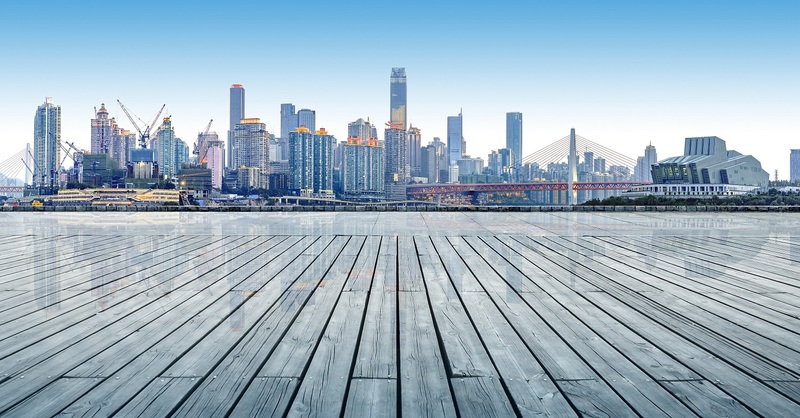 The property sector in China is caught in a spiral such that each time the economy begins to slow, the property sector is among the first resorts to refuel the economic engine. For example, look at this round of the real estate cycle. 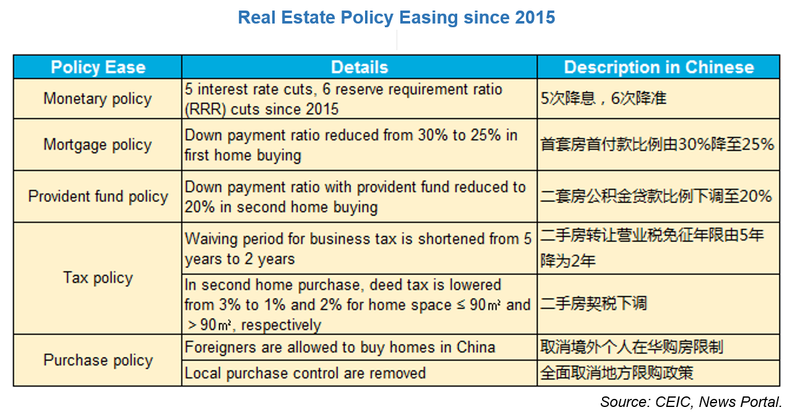 Since early 2015, the authorities have released a number of stimulating policies to encourage home buying for inventory depletion. But once unleashed, the market cannot always grow as expected. From time to time, optimistic expectation permeates the market, speculators rush in to push up housing prices, and the herding behaviors of ordinary buyers just worsen the whole situation until tightened policies are finally enforced. Since the Global Financial Crisis in 2008, there have been roughly three real estate cycles based on property price movement, and we are now in a down cycle that started in November 2016. If there is no fundamental structural change, this cycle will last around 12 months, ending in 4Q 2017, following the duration of previous down cycles. The up cycles generally last much longer, almost twice as long as down cycles. In China, the concept of “hard asset” makes housing properties seem like ”risk-free” assets to many people. Consider them as a kind of wealth management product (WMP): In a hot market, housing properties can appreciate over 10% on an annual basis, far outpacing the investment returns of any other existing assets. Additionally, buyers can collateralize them to borrow 70% of their total value or rent them out to earn dividends (rents) in addition to self-occupation. With 70% of property value mortgaged, buyers can earn much higher return than just the normal appreciation of property price, as long as the borrowing rate (cost) is below property return. This is the so-called leveraging effect. 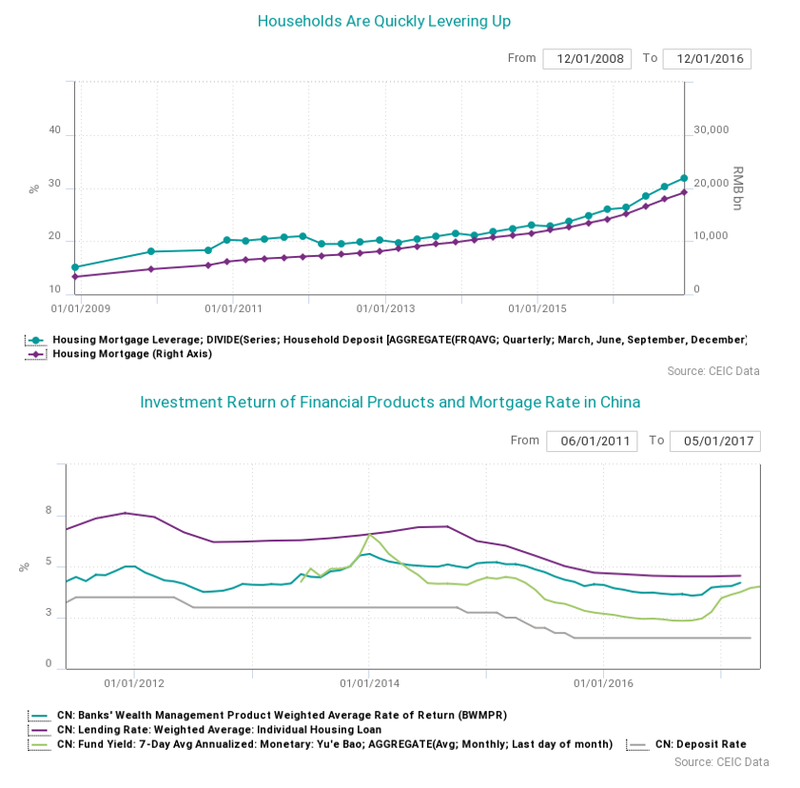 Using this effect, Chinese households quickly levered up—the pace has significantly accelerated since February 2015, which is exactly the starting point of this property cycle. 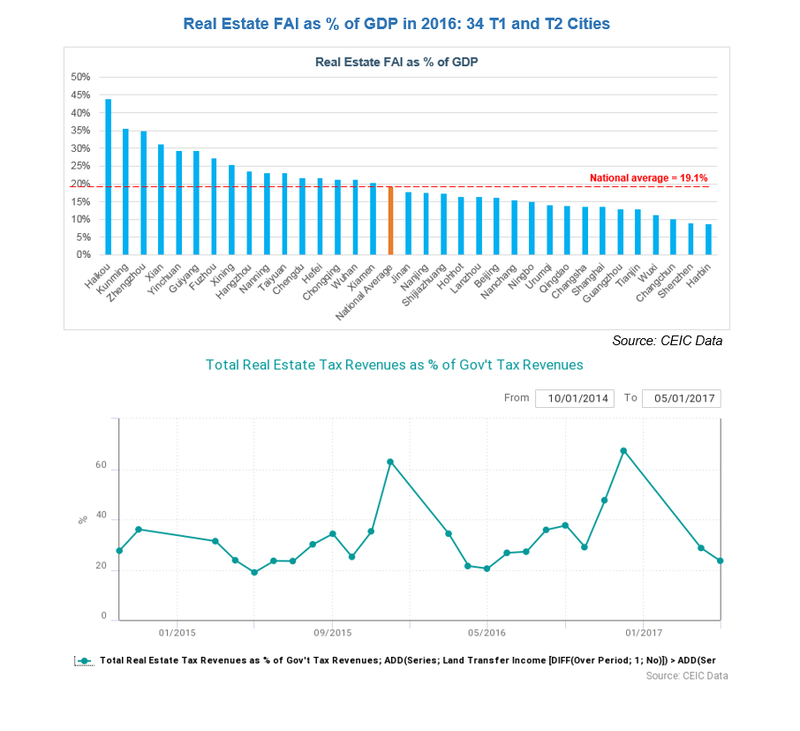 It is not surprising that authorities, whether at the central level or the local level, rely heavily on the real estate sector, whose tax revenues accounted for, on average, one-third of total central government revenues in the past three years. For every 100 yuan GDP, real estate investment accounted for nearly 20% last year. Drilling into the city level, we find that 16 out of 34 Tier 1 and Tier 2 cities (almost half) had higher investment reliance than the national average. Haikou, the capital city of Hainan province, has outstandingly high real estate FAI (44% of 2016 GDP), followed by Kunming (36%) and Zhengzhou (35%). Thank you for reading our whitepaper on the China Real Estate Observations. This paper was created using the CEIC China Premium Database. For more information on the databases we have to offer check out our website or contact us below.